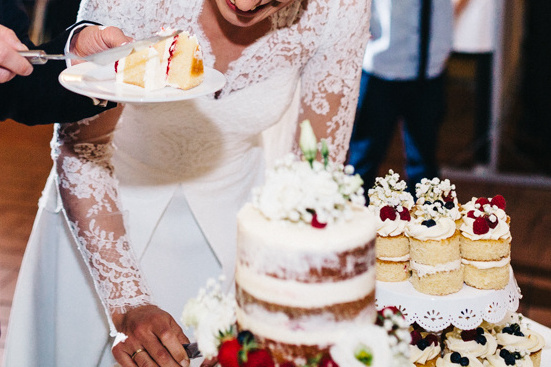 So, what was so cool about making that wedding cake? First of all, you have to plan ahead. You have to translate recipes to the exact amount of ingredients you will need overall. You have to bake and bake so you can estimate if you need a yellow cake recipe with 4 eggs or with 5 eggs for the three layers of the smallest tier (you also have to have someone who will eat all your trial cakes, which can be a little difficult living with just one roommate and not wanting to eat the cakes yourself because you can already figure how you’ll look like if this goes on for much longer). 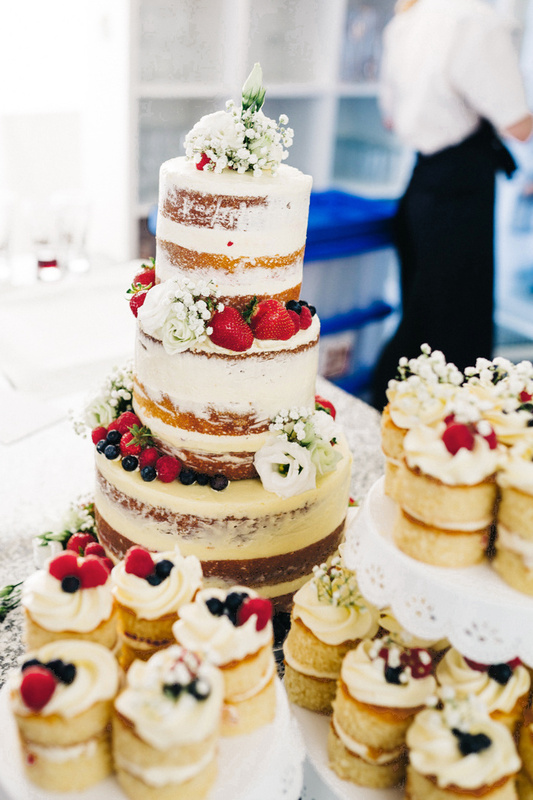 You have to build a picture of what the cake will look like, what will be on top, which flowers to use, which berries to use, which dowels to use, how long they have to be. You also have to estimate the costs so you don’t get that much poorer than you already are. Basically, make an EXACT plan so that you don’t have to improvise once you’re in the process itself. Ha. You wish! Second, you get to see how well you planned everything, and also how badly you planned everything. You get all these little ups and downs. „Wheeeeee, I said I needed 80 eggs and look – I really do!“ and „Cool, this is exactly the amount of berries I calculated (after I eat the left over ones)“ but also „?%&@, I messed up the raspberry filling and it’s 10 o’clock and I have no car and I have to get new ones and prepare them and I have to do basically everything else in time too“ and „Oh Glob, I just have one and a half hours left and I haven’t iced any of the cakelets yet and also it’s 30°C in here and the buttercream is melting“. I thought I had time planned very generously. 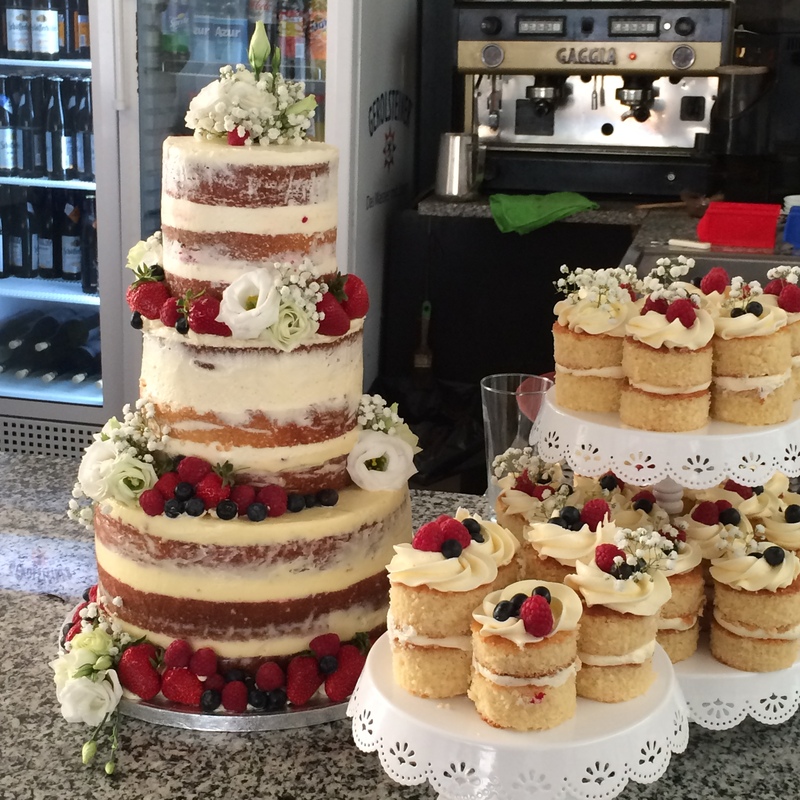 I baked the evening before the wedding, and made the buttercream and decorated the very day of the wedding. 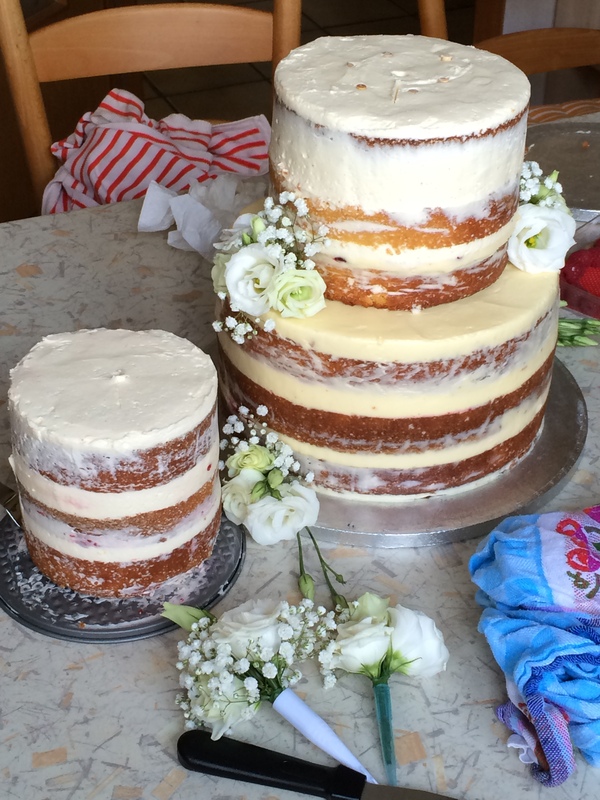 I assumed I needed 7 hours decorating, and I made it in 7,5 but only because I really hurried myself after shockingly realising how late it was and because my mom helped me whip the buttercream (thanks Ma). Third, you get to make giant batches of everything! And that feels reeaaally professional. I think I had 80-100 eggs in total, and some kilograms of butter and lots and lots of sugar. And of course the buffer for when things went wrong. Sometimes I was really greatful for having planned in that buffer. Thinking of making 12 muffins with 2 eggs – Pah! I felt like a baker and I enjoyed it, knowing that opportunity wouldn’t come again very quickly. Fourth (why am I even still using numbers, I think you’re getting there were many things I liked about that cake…), the decorating is SO MUCH FUN! 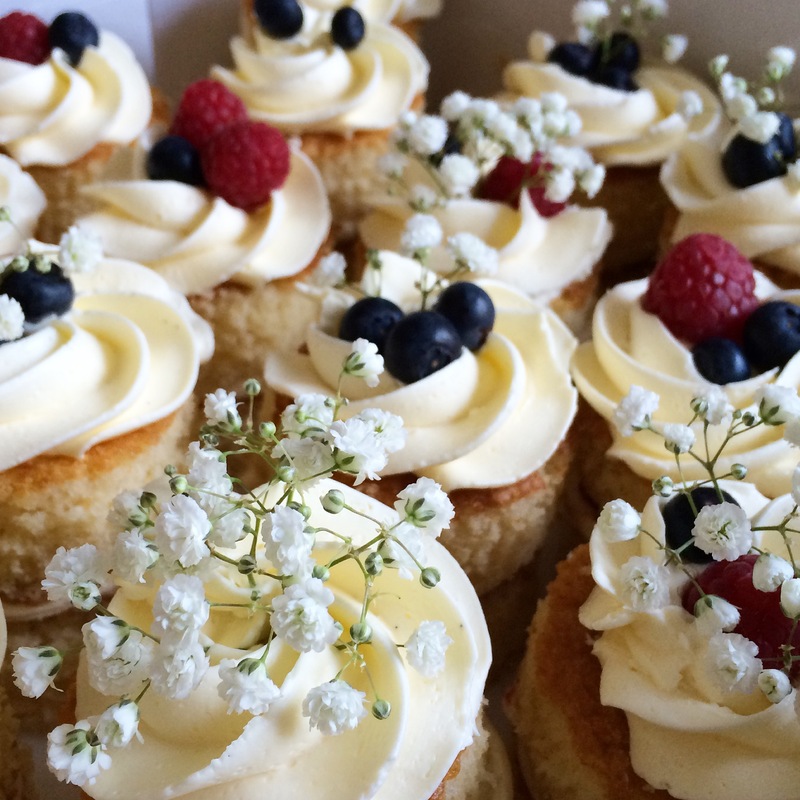 I had bought extra strong piping bags for the big amounts of buttercream. I finally had the opportunity to use all my pallette knives and bench scrapers and my new cute étagères. I got to bind the flowers, complete with wire, florist tape and flower picks with water inside. 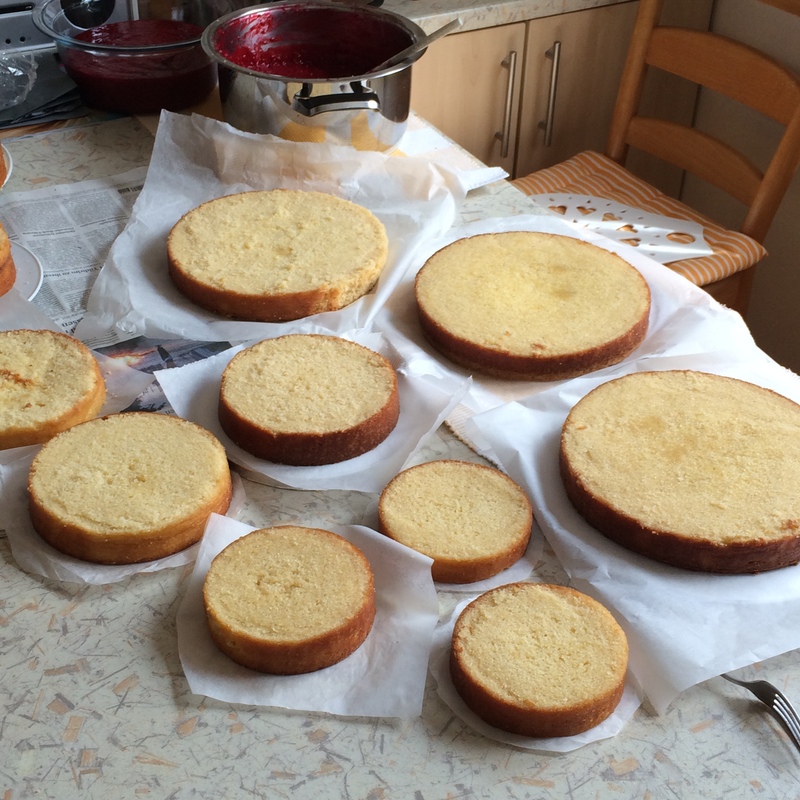 I let my Dad drill holes into the cake boards (he wanted help very badly, so…), I cut the dowels and measured everything so that all the yummy stuff stayed where it should. And it was awesome! It was’t just baking, but also crafting. I had so so so much fun, and I would do it again the minute anyone asks me. And finally (fifth..?! ): You get to see all the happy faces. I hadn’t been able to give so many super nice people something to be happy about since, I don’t know? I really don’t remember. I couldn’t believe it. Apart from it being the PERFECT wedding and location it was the people who were best. 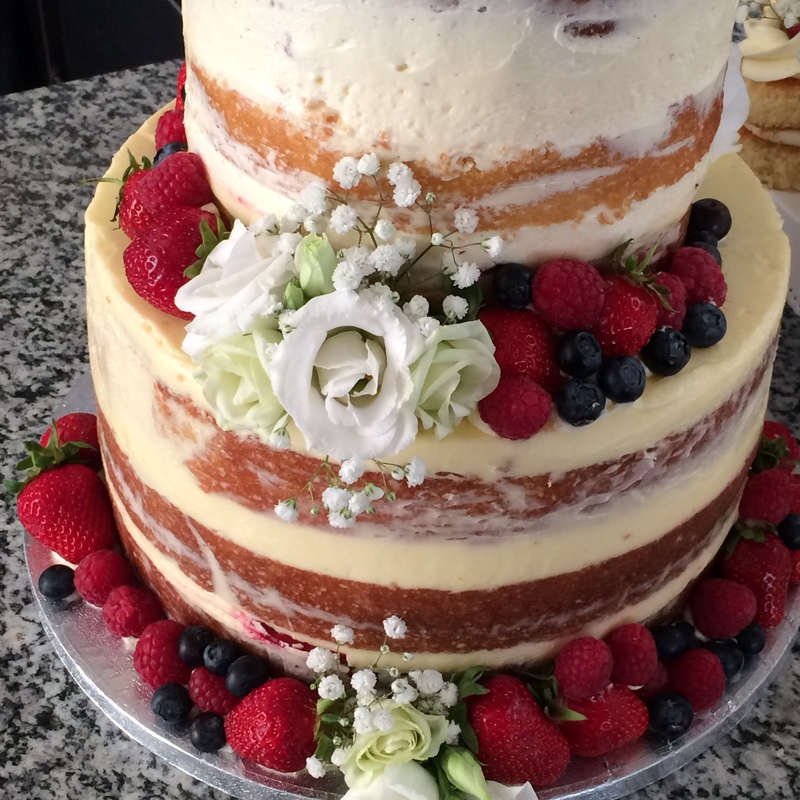 The bride was so happy and so many cute people came up to me and told me how beautiful the cake was (and how good it tasted, after the wedding). And you couldn’t wish for a more wonderful bride. Seriously, making people happy and getting back smiles and kind words for what you are doing are the best reward possible. This is what makes me love baking so much. Not just the process itself and being able to create beautiful things and be damn creative, but the reactions. The emotions. And thus ends the cheesy sermon you needed today. You’re welcome. Have a nice one!